Linfield's hard-fought 2-1 win over Ballinamallard puts them just two points behind Premiership leaders Crusaders. The second-placed Blues took an early lead through Andrew Waterworth but Adam Leckey hit an equaliser for Ballinamallard in the second half. 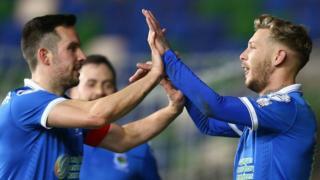 The decisive score was an own goal by Ballinamallard's Ryan Morris.